A tomb is a repository for the remains of the dead. Derived from the Greek tymbos, meaning "burial ground," the term generally refers to any structurally enclosed interment space or burial chamber. The term is used in a broad sense to encompass a number of such internments including graves, burial vaults, church monuments, funerary monuments and memorials. Tombs are generally located in or under religious buildings, such as churches, or in cemeteries or churchyards. They may also be found in catacombs, on private land or in open landscape. Most tombs reflect a system of religious beliefs, and are used by archaeologists to determine significant insight into cultural ideals as well as the status and wealth of those buried there. Examples of famous tombs include the Taj Mahal at Agra, India, the Dome des Invalides in Paris, and the Lenin mausoleum in Moscow. The tomb of Emperor Nintoku of Japan and the Great Pyramid of Khufu in Egypt are the largest tombs in the world, built for those believed to be incarnations of gods. The concept of the tomb is believed to to have merged from the prehistoric practice of burying the dead under their area of residence. In some circumstances, it was believed that housing structures were sealed and abandoned after an individual’s death. Corpses were often buried underground and stones laid over the bodies for protection from scavengers, or for possible confinement of the human spirit. The stones also served as informal markers, allowing for sacrifices or offerings to be left. The religious beliefs of the society were important in determining the structure of the tomb. Thus, for Egyptian pharaohs who believed death to be transitory, their pyramids served not only as a place to gather all the items they would need, including servants, but were also designed with a passage connecting the earth to the afterlife with the intention that their souls could more easily ascend to heaven and later return to their bodies. In the medieval Christian era, the tomb served as a representation of a religious home, giving birth to the intricate system of Roman catacombs. Christian churches were erected over the graves of martyrs, which also served to house the remains of kings and other privileged religious officials. Early prehistoric tombs frequently took the shape of small burial mounds or barrows, which consisted of small earthen hills piled over the remains of the dead. Such barrows were often built around a hut-like structure which contained the deceased's personal effects, believed to be for use in the afterlife. Such barrows were common throughout Japan, known as kofun, and were skillfully surrounded by man-made moats. Burial mounds in some societies also took the shape of certain animals. As time and technology advanced, many burial mounds were adorned with brick and stone, eventually producing large structures entirely made of such materials. Egyptian tombs, taking the form of pyramids, often grew to the most imposing sizes. Early Roman tombs were constructed as symbols of a heavenly home; the walls of many Roman catacombs displayed intricate scene of paradise, as did the ornate mausoleums that housed Roman royalty. Such tombs also contained elaborate sculptures reflecting a lavish and cultured existence. These artifacts displayed acts of feasting, dancing and singing, and are believed to have reflected the life and culture that was enjoyed by the deceased in life. Some Roman tombs even housed food, cooking vessels, toiletries, arms and armor. The most ornate were found to house kitchens and guest rooms for visiting family. Early church monuments, dating from the early twelfth century, were first simple stone coffin-shaped grave coverings incised with a cross or similar design. The first attempts at commemorative portraiture emerged soon afterwards, gradually becoming full high-relief by the end of the fourteenth century. Such monumental effigies were often carved in stone, marble, or wood, or cast in bronze or brass. Often the stone effigies were painted to resemble life. By the early thirteenth century, the effigies became raised on tomb-style chests, known as tomb chests or altar tombs, decorated with foliage, heraldry or architectural detailing. 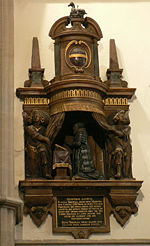 In the sixteenth century, church monuments became increasingly influenced by Renaissance forms and detailing particularly in France, the Netherlands and eventually England. There were major innovations in effigial posture, the portrait of the deceased often being shown reclining or kneeling in prayer and surrounded by the whole family, as in life. The seventeenth century saw an increase in classicism and the use of marble. Effigies might be sitting or standing, grief-stricken, shrouded or, unusually, rising from the grave. Busts and relief portraits were popular. High Baroque monuments were some of the grandest ever constructed. Decoration turned to cherubs, urns, drapery, and garlands of fruit and flowers. In the eighteenth century, church monuments became more restrained, placed before two-dimensional pyramids, but more Roman-like, with the deceased often depicted in Roman dress or as a cameo-like "medallion portrait." The Rococo style gave more movement to these figures. The early nineteenth century introduced the Greek Revival monuments which included wall plaques often adorned with sentimental and romantically realistic figures. 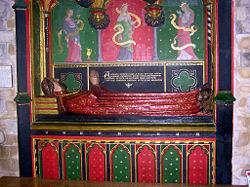 Gothic Revival followed, with a return to tomb chests and recumbent effigies. However, the Victorian era saw many differing styles, until large-scale monuments fell out of fashion at the end of the century. Today, large-scale monuments are not unknown, but quite rare. Since the Renaissance, the idea of a tomb as a home has been abandoned, replaced instead by more simple territorial markers or ceremonial centers. Tombs continue to remain structures for the burial of the dead, and often reflect various religious or cultural affiliations held by the deceased in life. Archaeologists regularly use tombs and tomb structures to draw conclusions about past lifestyles and cultures throughout the world. Burial vaults, made of stone or often brick-lined, are underground spaces for interment, rather than burial directly in the ground. Originally vaulted, burial vaults were often privately owned by family groups and were established beneath a religious building such as a church or kept in a churchyard or cemetery. A burial vault is a lined and sealed unit designed to support the pressure of the earth above it. Today, burial vaults are designed not only to hold the weight of the earth above them, but also to support the passage of heavy equipment over it. Most cemeteries throughout the United States and Canada require the use of a burial vault in order for a casket to be legally buried. A chamber tomb is a tomb for burial used in many different cultures. In the case of individual burials, the chamber is thought to signify a higher status for the interree than a simple grave. Built from rock or sometimes wood, the chambers could also serve as places for storage of the dead from one family or social group and were often used over long periods for the placement of multiple burials. Most chamber tombs were built from large stones or megaliths and covered by cairns, barrows, or earth. The term also applies to tombs cut directly into rock and wooden-chambered tombs covered with earth barrows. A church monument is an architectural or sculptural memorial to a dead person or persons, often in the form of an effigy or a wall tablet, located within a Christian church. It usually resides immediately above or close to the actual burial vault or grave, although very occasionally the tomb is constructed within it. Once the subject of antiquarian curiosity, church monuments today are recognized as fine works of art, as well as a highly detailed and invaluable record of antique costume and armor and, from the middle of the fifteenth century, of genuine face-portraiture. The church monuments of England, in particular, have been preserved in far greater numbers and, generally, in better condition than those of other countries. Fine examples may be found in cathedrals and parish churches in every county, and include Turvey in Bedfordshire, St. George's Chapel, Windsor in Berkshire, Chenies & Wing in Buckinghamshire and St. Michael's, Macclesfield in Cheshire. A mausoleum is an external free-standing building constructed as a monument enclosing the interment space or burial chamber of a deceased person or persons. 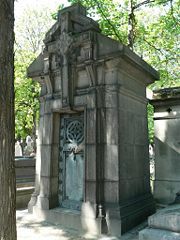 A mausoleum may be considered a type of tomb, or the tomb may be considered to be within the mausoleum. A Christian mausoleum sometimes includes a chapel. The word derives from the Mausoleum of Maussollos, near modern-day Bodrum in Turkey, marking the grave of King Mausollos, the Persian satrap of Caria, whose large tomb was one of the Seven Wonders of the Ancient World. One of the most beautiful buildings in the world, the Taj Mahal, is a mausoleum. Called "the jewel of Muslim art in India and one of the universally admired masterpieces of the world's heritage," it was built by the Mughal Emperor Shah Jahan for his favorite wife, Mumtaz Mahal. A mausoleum encloses a burial chamber either wholly above ground or within a burial vault below the superstructure. This contains the body or bodies, probably within sarcophagi or interment niches. Modern mausolea may also act as columbaria (a type of mausoleum for cremated remains) with additional cinerary urn niches. Mausolea may be located in a cemetery, a churchyard, or on private land. 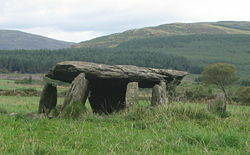 Megalithic tombs, including chamber tombs, are prehistoric places of interment, often used for large communities, constructed of large stones and originally covered with an earthen mound. Such tombs were over ground burial places, built by Neolithic farming communities from large stone slabs known as megaliths laid on edge. The stones were then covered with earth or other, smaller stones. Megalithic tombs are a type of chamber tomb, and the term is used to describe the structures built across Atlantic Europe, the Mediterranean and neighboring regions, mostly during the Neolithic period. 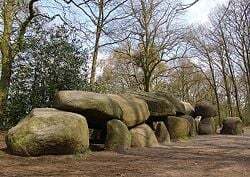 They differ from the contemporary long barrows through their structural use of stone and may contain cremations or articulated or disarticulated inhumations which were kept in the more accessible stone chambers, unlike those simply buried underneath barrows. Megalithic tombs appear to have been used by communities for the long-term deposition of the remains of their dead and some seem to have undergone alteration and enlargement. The organization and effort required to erect these large stones mean that the societies concerned must have placed great emphasis on the proper treatment of their dead. The ritual significance of the tombs is supported by the presence of megalithic art carved into the stones at some sites. Hearths and deposits of pottery and animal bone found by archaeologists around some tombs also implies some form of burial feast or sacrificial rites took place there. A sarcophagus is a stone container for a coffin or body. The word comes from the Greek sarx meaning "flesh," and phagien meaning "to eat," literally translating to "eater of flesh." The fifth century B.C.E. Greek historian Herodotus noted that early sarcophagi were carved from a special kind of rock that consumed the flesh of the corpse inside. In particular, coffins made of a limestone from Assus in the Troad, known as lapis Assius, had the property of consuming the bodies placed within them, and therefore was also called sarkophagos lithos, or flesh-eating stone. All coffins made of limestone have this property to a greater or lesser degree and the name eventually came to be applied to stone coffins in general. Sarcophagi were usually made by being carved, decorated, or built ornately. Some were built to be freestanding above ground, as a part of an elaborate tomb or tombs. Others were made for burial, or were placed in crypts. In Ancient Egypt, a sarcophagus was usually the external layer of protection for a royal mummy, with several layers of coffins nested within. 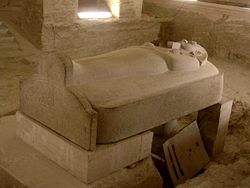 Sepulchres are cavernous, rock-cut or stone-built, underground spaces for interment, such as the tombs of Ancient Egypt. However most sepulchres are generally used to refer to similar Jewish or Christian structures. In ancient Hebrew practice, sepulchres were carved into the rock of a hillside. The term is also used for the sepulchral burial site of Jesus in Jerusalem, over which the Church of the Holy Sepulchre has been erected. Tombs of the Hebrews were generally excavated in the solid rock or were natural caves. Mention is made of such tombs in the Bible's Judges 8:32; 2 Samuel 2:32; and 2 Kings 9:28; 23:30. They were sometimes made in gardens (2 Kings 21:26; 23:16; Matthew 27:60). They were sometimes whitewashed (Matthew 23:27, 29). The body of Jesus was laid in Joseph of Arimathea's new rock-hewn tomb, in a garden near to Calvary. The mouth of such rocky tombs was usually closed by a large stone (Hebrew golal), which could only be removed by the united efforts of several men (Matthew 28:2; John 11:39). A ship burial, or boat grave, is a burial in which a ship or boat is used either as a container for the dead and the grave goods, or as a part of the grave goods itself. If the ship is very small, it is called a boat grave. This style of burial was used in the Vendel era and by the Anglo Saxons, the Merovingians, the Vikings, and occasionally the Ancient Egyptians. This burial was seen as a way for the dead to sail to Valhalla, and ship burial was viewed as a high honor. 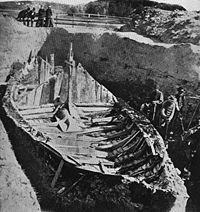 Some examples of ship burials include the Khufu ship at the Pyramids of Giza complex, the Sutton Hoo of East Anglia, England, and the Tune of Norway. ↑ UNESCO World Heritage List, Taj Mahal: Brief Description, 1983. Retrieved January 20, 2008. This page was last modified on 17 December 2015, at 16:46.